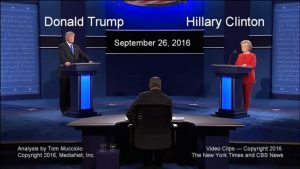 Body language, vocal tones, viewing angles, and more are described while observing the 2016 First Presidential Debate between Hillary Clinton and Donald Trump. This is a detailed look at the non-verbal cues and other staging issues that took place while the candidates exchanged barbs. The clips are taken from the online webcasts posted by the New York Times and CBS News. The 8-minute “condensed” video focuses on comparisons between the candidates, taken at various times during the debate. Click on the image to navigate to the visual analysis.